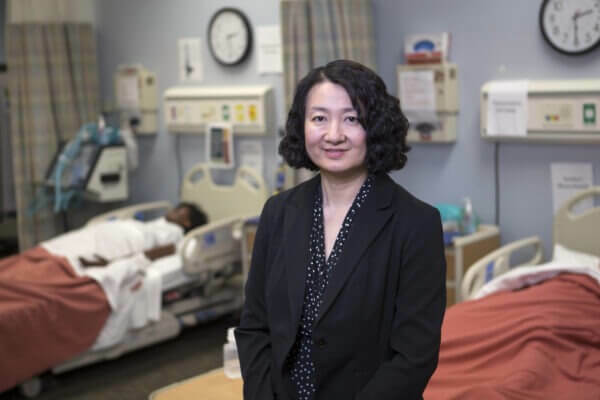 NIU Nursing Professor Jie Chen has been named a 2018 Nurse Educator Fellow by the Illinois Board of Higher Education (IBHE) and the Illinois Nursing Workforce Center Advisory Board. She was awarded $10,000 to help promote excellence in nursing education. “These nurse educators are highly qualified, and Illinois is fortunate to have them in teaching roles in our state as we work toward reversing our nursing shortage,” said Al Bowman, executive director of the IBHE, in a statement. NIU College of Health and Human Sciences Dean Derryl Block said Chen is an asset to NIU’s nursing program. “Dr. Chen’s contributions make our already strong nursing program even stronger. We are very proud that she’s a Nurse Educator Fellow,” Block said. Recipients may use these funds to conduct research, attend or present study findings at a conference, or for continuing education. Chen used the funds to attend the 2018 Quality and Safety Education for Nurses (QSEN) International Forum in Florida this past May. At the forum, she connected with QSEN consultants and educators and learned about a wide variety of innovative teaching strategies based on other schools’ successes. “Utilizing what I learned, I have been working with my colleagues to develop teaching strategies in didactic and clinical courses to strengthen students’ knowledge, skills and attitudes on quality improvement, information management, and teamwork and collaboration,” Chen said. Nancy Valentine, interim chair for the NIU School of Nursing, said she envisions NIU nursing students becoming change-makers in the organizations where they will work, so teaching up-to-date quality-related information is important. “Dr. Chen will both enhance her teaching skills as well as help other faculty to adopt state of the art information so together we have a strong quality improvement thread throughout all courses,” said Valentine. Being named a Nurse Educator Fellow is a personal achievement for Chen who set out to earn this award.